The needle is harsh, in colour and especially shape. 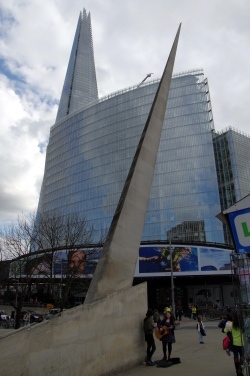 The Southwark Needle rather than pointing to the Church may be pointing down to Tooley Street and the location of two “tramlines” in the road marking the old position of London Bridge. The “ tramlines” are actually marked as such but most people walk over them without realising their significance. I was tilt that the Needle did originally have a small plaque long since disappeared.